Director Andrew Dominik has done something rather amazing. He’s made a movie about one of the most notorious outlaws in the history of America without showing hardly any of his law-breaking ways. And the fact he’s done it in a compelling, exciting way is a credit to his skill and talent. 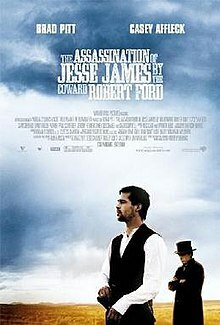 The film, The Assassination of Jesse James by the Coward Robert Ford, is an atmospheric tour de force, relying heavily on both Dominik’s skill behind the camera and the work of Brad Pitt and Casey Affleck in front of it. Both parts come together beautifully to reveal the first real awards contender of the season. In the simplest of terms, the film is the story of young Robert Ford, known to history as a coward, and his transformation from hero-worshipping gunslinger wannabe to disillusioned cynic. But that doesn’t really explain the appeal of the 160 minute film. Instead, you have to look at what’s happening just below the surface. Dominik, who wrote the screenplay from Ron Hansen’s book, delves deep into the characters and brings an almost biblical sense of destiny to them, recasting Christ as James and Judas, his betrayer, in the form of Bob Ford. When the final moment of James’ young life comes (he was only 34 when he was killed, and yet an international superstar) there is no choice for Ford. He must kill James because history demands it of him. In fact, they way the scene plays out, James himself demands it. Everything in the previous two plus hours leads directly to the moment when Ford points a new gun, given to him by James a day earlier, at an unarmed Jesse’s back. The target is presented and the shot taken. All goes according to plan and the outlaw is not only dead, but immortal; a martyr to a bygone era and patron saint to the rebel cause. At that point, I think you’d be hard pressed to think of Ford as a coward. It isn’t until later in his life, as he retreats from his own past that his bravery really comes into question. As I said, in order for this film to succeed, it needed two things to work in harmony. The first, Dominik’s direction, comes through in a slow, methodical approach. He uses long shots in complete defiance of accepted filmmaking techniques. Here, they actually provide insight into a character instead of distance, placing the person within the confines of the nature surrounding him rather than with a 35mm frame. He uses wide landscapes to define his characters rather than the other way around. However, this would be close to impossible without the performances of not only Affleck and Pitt, but the amazing supporting cast as well. Affleck is rapidly proving himself to be the one with acting talent in the family. He only gets better as he matures and I don’t think it will be long before he has a statue to match his brother’s. Pitt’s performance is no surprise, but mostly because he’s not in a leading man role. As a character actor, when he’s not asked to play himself, he has serious chops which often get overlooked in favor of his pretty-boy face. Backing these two are Sam Rockwell as Charley Ford and Jeremy Renner, Garret Dillahunt and Paul Schneider as members of the James Gang. No matter which of these men are on the screen, you are riveted by the honesty in their portrayals. Do yourself a favor and see this film. It’ll be one less on your list when the nominations are announced.